Where Do Glock Pistols Come From? If you own a Glock, or have ever seen a Glock in person, you’ll see that it specifically says “Austria” on the side of the Glock pistol. Austria’s military didn’t actually adopt the Glock until 1982. It was after an extensive series of rigorous stability, durability and longevity tests, that the Glock pistol was officially picked up by the Austrian police and military forces. Thankfully, the new implementation of the Glock replaced the Austrian army’s out-of-date Walther P38’s. The official original place of production and design for the Glock and its’ various styles was in a decently small town in Austria, but the name of Desutsch-Wagram. The weapons manufacturer, Glock Ges.m.b.H., has pushed the Glock upon the U.S.A. so heavily that Glock pistols now account for over 65% of the market share for all United States Law Enforcement. What has made Glock Pistols so popular? Glock Ges.m.b.H.’s founder and engineer, Gaston Glock, had a minor amount of experience designing firearms. He also had no experience as a firearms manufacturer, but by the time their first pistol was manufactured – the Glock 17 – it was in prototype form. The one thing Glock specialized in was advanced synthetic polymers. This specialization surely fit Glock right – it allowed Glock to become the first firearms dealer with a commercially successful line of polymer framed pistols. This raised some alertness among the people due to its’ plastic-like frame. People were worried that these new frames could act as a camouflage, and not be picked up through airport security, and metal detectors alike. Firearm enthusiasts saw the new range of Glock pistols as a way of being unique. Multiple types and styles were made directly after the G17. In current time, as of 2017, there are over 30 different Glock variants. All of these variants are loved for their slick style, polymer frame, and reliability. There’s a lot to the Glock that makes it unique… The Glock slide features a spring-loaded claw extractor and the ejector is pinned to the triggers mechanical housing. The strike firing mechanism contains a spring-loaded firing pin, and the factory standard trigger has a trigger travel of 12.5mm rated at 25 N (5.6lb). The Glock pistols magazine body, frame, and other components are made from the high-strength nylon based polymer. This polymer was officially named Polymer 2 and was resistant to caustic liquids and shock. The barrel of the Glock has a female type polygonal rifling, and the safety has three independent mechanisms to prevent discharge. The Glock 17 pistol loads from a staggered column/double stack magazine with a 17 round capacity. Optional 33 round high-capacity magazines are available, or for jurisdictions which limity magazine size to 10 rounds, Glock has single-load 10 round mags. Lastly, the Glock 17 pistol and Glocks alike have fixed polymer combat-style sighting arrangements, with a ramped front sight and notched rear sight – which contrast elements are painted on for increased draw speed and accuracy. A white dot is painted on the front post, and a rectangle border on the rear. But, how many variations of Glock pistols are possible? The Glock pistol has been around for just over 30 years – and whole lot of variations of the Glock have been manufactured. Firstly, the original 9x19mm Parabellum Glock 17 held 17 rounds and included multiple variations, including the Glock 17L, 17C, and 17MB. The Glock 18 was a selective-fire modification of the Glock 17. The Glock 19, introduced in 1988 was a ‘compact’ Glock variation, and were about a half an inch shorter in barrel and grip length. 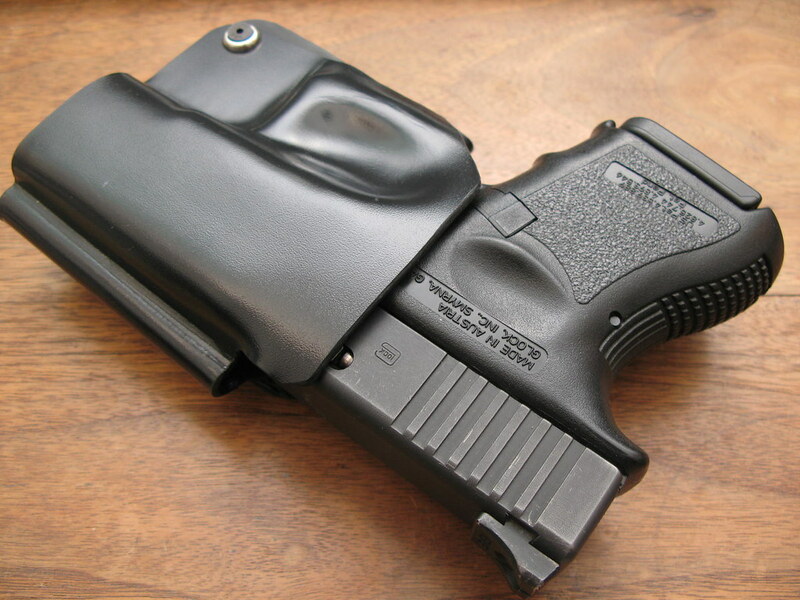 The Glock 26 was designed for concealed carry, and brought to the market in 1995. The competition version of the Glock 17, the Glock 34 has a short slide and barrel to fit the maximum size and length requirements for sport shooting. Uniquely, the Glock 43 is the first pistol manufactured with a single stack 9x19mm Parabellum mag. The Glock pistols that are chambered in 10mm auto include the Glock 20, 29, and 40. The Glock 40 (2015) is made with the fourth generation (Gen4) frame. Glock’s also come in 45 ACP, for those wishing to pack a punch. These variations include the Glock 21, 30, 36 and 41. Another caliber Glock specializes in is .40 S&W. Glock variations in the caliber of .40 S&W include: 22, 23, 24, 27 and 35. The Glock 22 is heavily used among police forces in the United States. This pistol is enjoyed due to its’ modified slide, barrel and frame accounting for the large caliber of .40 S&W. Glock’s have three variations chambered in .380 ACP (25, 28, 42), and three more chambered in .357 SIG (31, 32, 33). Lastly, the Glock 37, 38 and 39 are the only .45 GAP variants of Glock pistols.